Diazogen is a nitrosylating agent for transition metal complexes, amines and carbanions, as well as a preferred precursor to laboratory preparation of diazomethane. Due to its instability and toxicity, diazomethane is not amenable to storage or transport.Therefore, several diazomethane precursors have been developed over the past few decades.Of the precursors used, N-methyl-N’-nitro-N-nitrosoguanidine (MNNG) and N-methyl-N-nitroso-p-toluenesulfonamide (Diazogen) have been the most popular. MNNG is toxic, and whilst Diazogen is also considered to be a severe irritant, it has not demonstrated the acute toxicity of MNNG. It is therefore the precursor of choice. In microbiology, Diazald, has recently been reported to be a potent in vitro antimicrobial agent against yeasts, yeast-like and filamentous fungi as well as Gram-positive and Gram-negative bacterial strains. Custom packed. Request price on line. 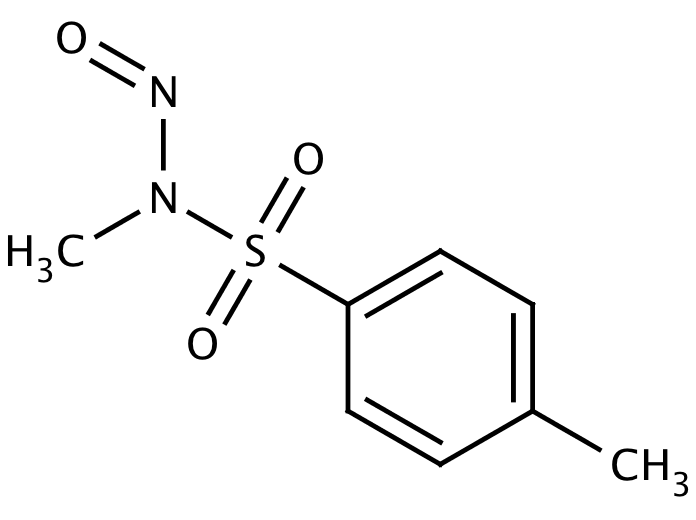 Send us your enquiry for Diazogen (N-Methyl-N-Nitroso-P-Toluenesulfonamide). We offer custom pack sizes at special prices. We aim to respond to your enquiry within 24 hours. We value your input so if you have suggestions regarding new applications for Diazogen (N-Methyl-N-Nitroso-P-Toluenesulfonamide) email us and we will include your contribution on the website.